Beverly Scott has written extensively in the field of organization development, which had been her career. She also has written about other topics of interest such as aging, diversity, and genealogy. “Internal consultants” –staff members who serve in consultative roles in their organization – face unique challenges in balancing the tension between being knowledgeable insiders and the need to give honest, direct feedback to their clients. Now in its 2nd edition, this book from ATD Press provides a practical, hands-on guide to help internal consultants in any field succeed and cultivate their careers. 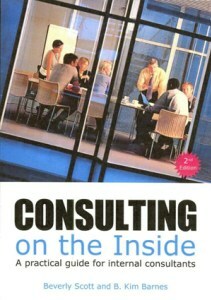 Consulting on the Inside, A Practical Guide for Internal Consultants by Beverly Scott and B. Kim Barnes, is a solid resource for internal consultants at all experience levels. …Read more. Consulting on the Inside is available from ATD Press, the publishing division of the Association for Talent Development (formerly ASTD, American Society for Training & Development). perspectives, secrets and challenges…Read more. 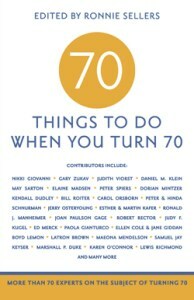 A perfect gift for anyone reaching this milestone age! The contributing authors provided essays on a pro-bono basis. The royalties generated from the sale of this book will be donated to non-profit organizations dedicated to preventing and curing cancer. For downloads and links to many of my articles and essays, click here. The topics are organization and management consulting, and leadership coaching.